Lalor Park Preschool is a non-profit, community-based Preschool rated ‘Exceeding’ in all 7 areas of the National Quality Standards. We offer a high quality educational program for children in their year prior to school, which is based on the National Quality Framework and Government endorsed ‘Early Years Learning Framework- Belonging, Being and Becoming’. We aim to contribute positively to children’s leaning by providing an inclusive environment where they can develop a strong sense of identity and well being, feel safe and have an opportunity to contribute to their world. We aim to provide an integrated enquiry based curriculum where children have many opportunities to learn through play to become confident, involved learners and effective communicators. The Preschool is licensed by the Department of Education and Communities for 40 children each day and priority is given to children in their year prior to school. Children can attend 2 or 3 consecutive days per week- Monday/Tuesday or Monday/Tuesday/ Wednesday, or Thursday/Friday or Wednesday/Thursday/Friday. 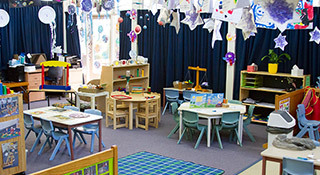 Our teachers are University trained with a Bachelor of Education (Early Childhood) and all staff have many years experience working with children. In addition to the Bachelor of Education (Early Childhood) , the Director also holds a Masters of Education (Leadership). The Department of Education and Communities specifies staffing regulations and Lalor Park Preschool well exceeds these minimum standards in both staffing ratios and qualifications. We believe this is vital in the provision of high quality educational programs that facilitates children’s learning and development in preparation for their transition to school. All staff members hold a current First Aid certificate, as well as Anaphylaxis, Asthma and Child Protection Certificates and regularly attend courses and training in different areas of early childhood education to further contribute to the provision of a high quality program for children. Children may go on the waiting list after their 2nd birthday and parents are strongly encouraged to do this as soon as possible as the waiting list is extensive. There is no waiting list fee. Families are welcome to visit at any time and ask questions about the Preschool and the children’s program.